Meyer lemons, a cross between a lemon and mandarin orange, are in season for just a short time across the holidays. In this recipe, the sweet-tangy flavor that is unique to these tasty lemons brings a fresh and different dimension to fresh green beans. The breadcrumb and cheese topping complete the effect, making this one of the best sides of the season. Make extra sauce and topping and keep them in the refrigerator for other green vegetables, including broccoli and asparagus. Serves 6-8. Adapted from Fine Cooking. Heat a 10-inch non-stick saucepan over medium heat and add Panko; add 2 T olive oil, salt and pepper. Toast until breadcrumbs begin to color, 3-4 minutes. Remove from heat and let cool. Add Parmesan. In a medium bowl, whisk the lemon zest and juice, cream, ½ t salt, and 1/4 t pepper. Slowly whisk in the remaining ½ C oil. Bring a large pot of salted water to a boil over high heat. 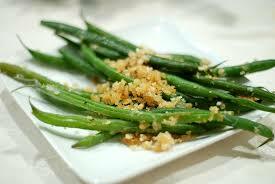 Cook the green beans in the boiling water until tender, 4 to 6 minutes; drain well. Toss the beans with the vinaigrette. Taste and adjust the seasoning if necessary. Transfer the beans to a serving platter and sprinkle with the breadcrumbs. The crumbs can be prepared the morning of the meal and stored in an airtight container at room temperature. The vinaigrette can be made a day ahead and stored in a covered container in the refrigerator. This entry was posted in Sides, Vegetarian and tagged beans, cheese, lemon, meyer lemon, panko, parmesan, vegetarian. Bookmark the permalink.